When a diabolical billionaire intends to take over the world, the United States government has only one team that can get the job done right. A group of highly trained secret agent Guinea Pigs. Using their armory of tiny weapons and gadgets, the little furballs set out to stop the evil plan before it is too late. "G-Force" is a amusing summer family adventure that has great voice talents and stimulating special effects. The guinea pigs and other rodents throughout are entertaining, but that comes as a direct result of the solid voice performances. The positives unfortunately end there. The story felt over borrowed or just too generic and it didn't have near the amount of laughs I was expecting. Ultimately "G-Force" just didn't have enough to keep the kid in me entertained. You know walking into a film about super agent guinea pigs, that the plot of the film isn't necessarily as important as the CGI and the laughs. I am all for escapist fun and enjoy not thinking, but here I just never became immersed in the film. I didn't hate it, it did keep me some what entertained, but overall I just kept reminding myself this one is for the kids. My kids reactions to the movie was a whole different beast. They loved it. From the talking guinea pigs and other rodents to the dancing cockroaches they stayed enthusiastic all the way through. They laughed at every joke that came their way and wiggled in their seats when the soundtrack would kick in. They oohed and awed at all the special effects and cheered when the guinea pigs would defy the odds against them. Overall, they had a blast. I must give a lot of credit to the talented voice cast. Sam Rockwell was darn good as Darwin, the lead guinea pig. Rockwell was assertive throughout as the leader, while also providing a bit of comic relief. Tracey Morgan was entertaining as Blaster and pulled off his usual schtick fairly well for being a PG rating. Nicolas Cage delivered a surprising performance as Speckles, one that you can barely recognize it is him if you didn't already know he was in the movie. Jon Favreau provides a lot comic relief as Hurley along with Steve Buscemi as the voice of Bucky. Buscemi as Bucky was hands down the funniest rodent showcasing his usual inferiority complex. It is a movie centered around covert animated guinea pigs, but most of the live actors felt drastically under utilized. Bill Nighy is a great talent and here in "G-Force" he goes unnoticed other than a 3D effect involving a fly and his nasal cavity. The same can be said about Zach Galifianakis as Ben, the scientist who trained the guinea pigs for government work. If it wasn't for Galifianakis other previous comedic roles, you wouldn't even know he was funny in "G-Force." "G-Force" obviously is a kids gimmick movie and from that perspective it works. The special effects are fun, most of the 3D effects only layer the story instead of having objects popping out at the audience, which is nice. I most enjoy 3D when it is like looking into a window rather than having lame gimmicks flying out at me. Luckily "G-Force" like most of Disney's other 3D ventures, is picturesque. The soundtrack is high energy and keeps the 89 minute movie moving along at a decent pace. The story is overtly generic, with just another plan to take over the world, though for most kids that will go unnoticed. 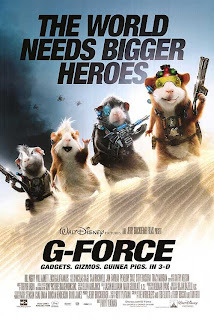 "G-Force" has a ton of laughs for kids (not so much adults), but overall its a fun family film that is worth making a trip to see in 3D, just don't expect the best family adventure of the summer.